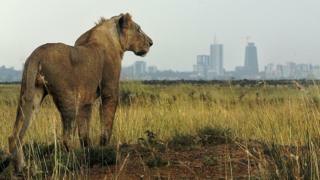 A lion has attacked an elderly man in Kenya's capital, Nairobi, after straying from a nearby national park. The animal became agitated with people hooting their horns and taking selfies, a wildlife official said. The lion has returned to the park and the 63-year-old man is in hospital, Paul Udoto, spokesman for the Kenya Wildlife Service said. The city was put on high alert last month after several lions escaped from the park, causing panic. A video circulating on social media appears to show the lion wandering along a busy road during morning rush hour. Rangers are still on the streets of the city in case there are other lions around that have not been spotted, Mr Udoto added. The park is separated by a main road from densely populated neighbourhoods, including Kibera slum, in the south of the city. A loss of habitat for lions in the city means they are increasingly coming into conflict with human populations, putting their survival at risk, Kenyan conservationist Ali Kaka told the BBC. "If there is no prey or there isn't enough prey in the park the animals may decide to wander out," he added. Nairobi National Park is fenced in on the city side but is open elsewhere to allow for the annual wildlife migration. In 2012, four cubs had to be placed in an orphanage after a similar incident led to their mother being killed.